House Maid Jobs are the mostly desired jobs in UAE. 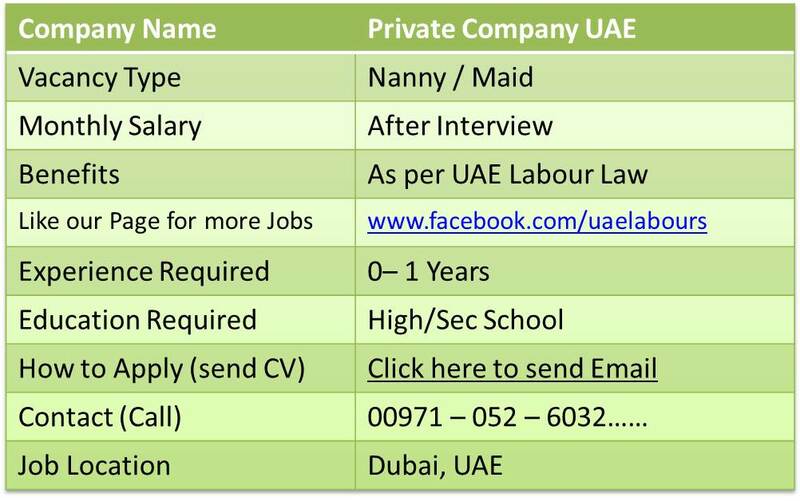 A well Establish Family in Dubai is looking to hire Live in Nanny / Maid for Dubai. Should have minimum of 1 Year experience . Siri Lankan nationality will be preferred. Salary to be discuss during the interview. Candidate should be join immediately. Interested applicants can send their CV to the below E-mail. Other all benefits as per UAE Labour Law. If you have the skills and experience which is required for Nanny / Maid , please forward your resume to below Email Address, or through provided Contact Number Shortlisted Candidates will receive confirmation email. Call : 00971- 052 - 6032454.